In These Times is a Chicago based socialist journal. Weinstein was joined in establishing this independent magazine of news, culture and opinion by noted intellectuals Daniel Ellsberg, E.P. 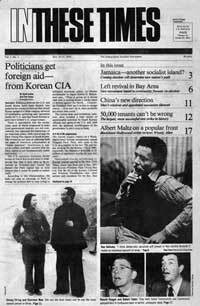 Thompson, Noam Chomsky, Barbara Ehrenreich, Julian Bond and Herbert Marcuse, all of whom were among the original sponsors of the magazine . In These Times has frequently scooped the mainstream media on stories ranging from the first coverage of global warming and extensive investigative reporting on the Iran Contra scandal in the ‘80s to early in-depth coverage of the genocide in the Sudan in 2004. Such reporting has earned In These Times more Project Censored awards than any other magazine. Over the years, In These Times has published the work of a wide range of noted writers, including fiction by Alice Walker and Kurt Vonnegut; reporting by Clinton speechwriter David Kusnet, former New Republic editor Andrew Sullivan, and current Salon Editor-in-Chief Joan Walsh; and political commentary by former presidential candidate George McGovern, environmentalist Sandra Steingraber, the late Democratic Sen. Paul Wellstone of Minnesota, novelists Barbara Kingsolver and Dorothy Allison, and a number of contemporary members of the House of Representatives who contribute to the magazine’s “House Call” column. In 1981, In These Times congratulated NAM on the occasion of its 10th anniversary. That is, mags which express the range of our politics, from the revolutionary to the left liberal, and including some sympatico Candian and British mags. 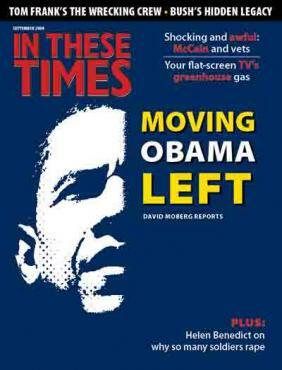 In These Times - America's leading independent socialist weekly. Most of the editors are DSAers or DSA-fellow travelers, but unlike the Guardian the coverage is of progressive contemporary politics and not of the activist subculture. Reading ITT gives one a sense that, though the left may not wave a red flag in all its battles, we are out there fighting real battles. This page was last modified on 28 December 2017, at 01:07.